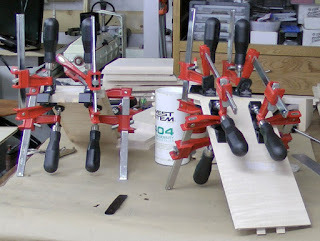 I busted out Angle Madness again and have been recording parts of the box assembly; hope to mix in a little of that build again while continuing on the Tim Burton Table build episodes. Pretty happy with that; it's a milestone. It means there's an awful lot of you who fell asleep on the refresh key! :) just kidding... thanks for reading! So, again, "thanks a million"
Ron and Ryan of Seneca Woodworking have been making some great accessories for the Domino; they're the ones who made the DomiPlate that production cabinet shops using the Domino really love. The DomiPlate was for the DF-500, so they've since come out with DomiShims for the DF-700 XL Domizilla as well as a bit adapter that allows the Domizilla to use the smaller DF-500 bits. These accessories blur the already blurry line between a "500 project" and a "700 project" as the 700 can now make mostly the same holes the 500 can. But there are still significant differences you'll need to consider before picking one or the other, the biggest factor being your current projects. I'll be posting an article early next week reviewing those differences. For my email subscribers, here's the video link. The original DomiPlate review. The Domizilla XL DF-700 review. The Domino DF-500 review. The Norm made a surprise appearance at the Festool Connect 2013 event and gave a nice long talk about how he got into carpentry, where that moved to, where the show started and all the people surrounding his shows. I caught it live from the event stream, but they have posted his talk to YouTube. Clip is below... well worth the listen! 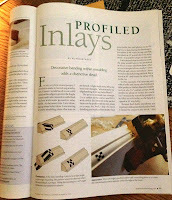 First, Mark Harrell of Bad Axe Tool Works let me preview an article he wrote for a magazine on how to tune your saw. Loved the article since it explained everything you need to do for 99% of the fixes he does as a Saw Doc. The article assumes you're not into posturing by chatting about saw fleam angles over coffee, which is great because I could never learn the secret handshake of that social group. If you score a nice backsaw at a fleam-arket (ah I get it now...), this article will walk you through re-tensioning and straightening out the plate. The right margin on his site lists other DIY articles including one on unlocking a frozen nut; handy for our Canadian readers. Next up, a magazine article I was behind on! My friend Rutager West wrote an article for Popular Woodworking's December 2012 issue (this is for the print issue, which may no longer be available when you read this). In the article, Rutager shows you how to inlay a checkerboard pattern on a curved radius. The plane in the lower-right photo is the HP-6v2 mini multi-plane I love; that profile is the corner bead although the corner cove (or any of the corner profile!) would look equally exciting on a box. 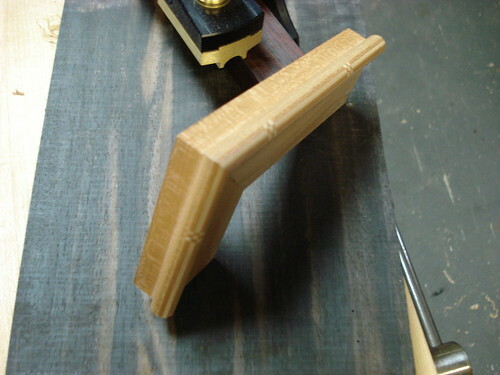 The article is a "corner bead" version of a well-documented thread Rutager did on the Bridge City forum where he put the inlay on a face bead (this is the profile I used for the Onyx frame in No Comment #2). Other good threads on using the HP-6v2 profiles for inlays include revealing a wood under the multi-bead; I've used this many times after reading this; an excellent effect. Last of the OPT ("other people's tidbits"), Scott Meek makes nice wood-bodied planes. He's decided to auction off this smoother with at least 50% of the proceeds going to the Moore, Oklahoma relief fund. Might be a great way to get one of these for less than retail! I have a watch on this. Hopefully the bids will be out of my range so I don't have to do that nervous last-minute-of-auction sniping. EDIT: Here is the updated eBay link; eBay had erroneously deleted Scott's auction since they are being cautious of any auction for "Moore charity" since so many were false. For me, my list of videos to roll has grown almost too fast this past week. That said, over the next two months, I should have 4 new Festool reviews along with the very interesting Seneca Woodworking reviews I'll be rolling after hitting publish. This without forgetting to finish the No Comment #2 build videos and get the drawer assemblies in place on Angle Madness. I need to quit my day job! Speaking of videos, thanks for letting me hit 3,000+ subscribers on YouTube!